The Canon PowerShot SX200 IS is an excellent first attempt at a travel-zoom camera, but ultimately it can't quite match its main rival, the Panasonic Lumix DMC-TZ7. Starting with the positives, the SX200 IS's main point of differentiation is the PASM creative shooting modes, which will instantly grab the attention of the seasoned photographer looking for a pocket camera that they can really control. 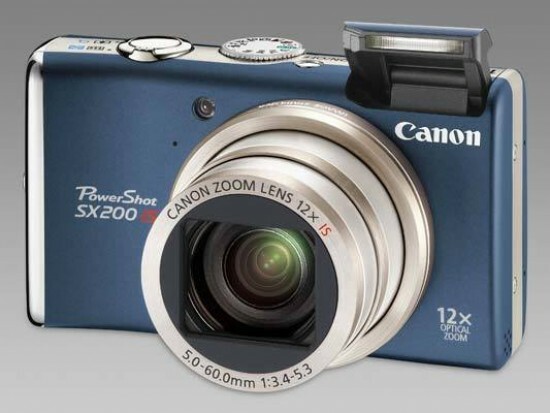 All of the other competitors in this category are purely point-and-shoots, so providing Aperture-priority, Shutter-priority and Manual modes is a big advantage for the SX200 IS. The 12x zoom lens is also a real highlight, with an incredibly versatile focal range of 28-336mm that will cover virtually every photographic situation that you'll encounter. It's not quite as wide as the DMC-TZ7's 25mm lens though, exhibits a little more distortion at either end, and is substantially bigger in size, making it less well-suited to more candid photography. The same can be said of the SX200's general dimensions, being bigger and heavier than its rivals - maybe only by a few grams and millimeters, but important none-the-less in an area of the market where size is everything. The SX200 IS does lead the way in the megapixel wars, with a 12 megapixel sensor that produces the usual quality images that we've come to expect from Canon. ISO 100-400 is a usable range for most photos, on a par with most of its main competitors, with the rather soft and desaturated ISO 800 setting best reserved for emergencies. The Canon PowerShot SX200 IS dealt extremely well with chromatic aberrations, macro performance is an amazing 0cms, and the image stabilization system really makes a big difference when hand-holding the camera at slower shutter speeds. Video is another story though. Although you can record 1280x720 pixel HD footage, it quickly fills up your memory card thanks to the space-hungry Quicktime format, suffers from the usual muffled mono sound, and worst of all doesn't allow the zoom to be used during recording. The HDMI port makes it easy to connect the SX200 to a HD TV, although we would have liked to see a suitable cable included in the box. Overall, it doesn't compare well to video shot with the Panasonic Lumix DMC-TZ7. Unfortunately for the Canon PowerShot SX200 IS, this is also true of quite a few other key areas too. The 3 inch LCD screen has a lower resolution, the continuous shooting speed is over twice as slow, the lens is a little slower, the flash inexplicably pops-up for every shot, and Smart Auto Mode isn't quite as smart as Panasonic's Intelligent Auto mode. Which leaves us with a still very capable camera that will particularly appeal to the more experienced photographer, but also a camera that comes a clear second in the race, rather than occupying the top spot on the winners' podium.